Buy the Toy Mini Market Cash Register at Amazon for only $8! Looking for an inexpensive cash register so your kids can pretend to shop?! 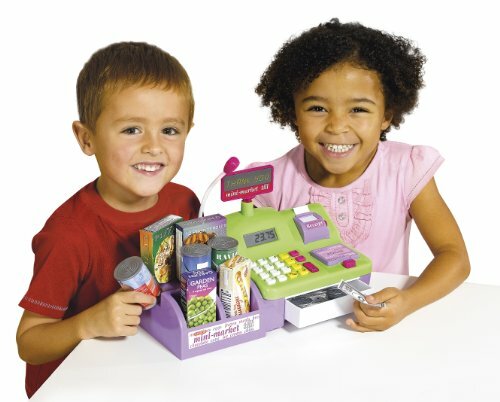 Hurry and get the Toy Mini Market Cash Register today for only $8.00 from Amazon! This same toy is on sale for $15 at Walmart (reg. $20)!! This would even be a great present for your gift closet!! This realistic Mini Market Till has been specially designed to provide hours of fun and stimulation so your little shopkeeper will really feel part of your world while developing essential life skills. It features a working calculator and a working microphone for making customer announcements or to ask for more help at the checkout. The Mini Market Till is a great way to boost counting and early maths skills: sort through the coins and banknotes, count them all up and practice calculating, add up the cost of all the food and giving change. Includes realistic food packaging, three play tin cans, and four play cartons. Buy the Toy Mini Market Cash Register at Amazon. Next articlePlaytex Coupons – FREE Sample of Playtex Sport Pads, Liners, and Combo Packs!